It doesn’t matter what the current world economic situation is, the Middle East can always be counted on to lap up luxury goods, be it that Louis Vuitton handbag in Starhill or ordering a Veyron for the Palm Jumeirah mansion back home. 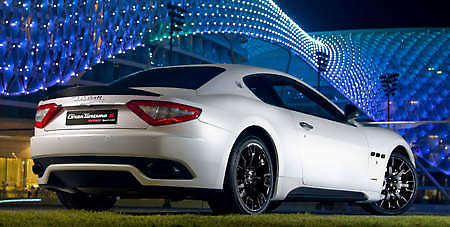 Exotic car manufacturers are a major beneficiary of this excess, but this is the most obvious seduction attempt so far: Maserati has produced a limited-edition GranTurismo S MC Sport Line with Matt White “ICE” finishing specially for the Middle East, unveiled last week at an exclusive event for selected Arab customers at Abu Dhabi’s Yas Marina Circuit. Only twelve of these GranTurismos will be made, representing twelve world titles won by the MC12 in the FIA GT International Championship since 2005: two Constructors’ Cups, four Drivers’ Titles, five Teams’ Titles and one Citation Cup. Twelve also signifies the Middle Eastern cities where Maserati is present with a dedicated showroom: each car will feature a plaque with the name of the city it’s allocated to. For the GranTurismo S, MC suspension brings a 10mm lower ride height, stiffer dampers and larger-diameter anti-roll bars that reduce roll by 20%. Overall rigidity is increased by 16% at the front and 32% at the rear. This is combined with drilled, slotted front and rear disc brakes plus a re-calibrated Maserati Stability Programme that allows the driver “greater freedom of action”. MC Sport Line options (available to Maserati clients worldwide) include an Aerodynamic Package that consists of double front winglets, rear lip spoiler, door sill inserts, black window surrounds, black exhaust pipes and body coloured door handles. Carbon fibre door mirrors and handles are also available. Maserati claims that these wind tunnel developed parts increase vertical load, allowing faster cornering and improved traction. Other add ons include gloss black alloys, dash carbon trim and aluminium racing pedals.